The following article by Rabbi Dr Raymond Apple first appeared in The Jewish Bible Quarterly, Vol. 42, no. 2, April-June 2014. Margaret Barker states, “The Psalms were the hymn book of the temple,” but the Mishnah does not tell us why, from the number of options expressing similar themes, these particular psalms were selected for each day. The fact is that the Hebrew text of Psalms in the Tanach generally lacks information identifying the occasion/s for which a psalm was used. Indeed, only the psalm for the Sabbath, Psalm 92, is named as a song for a particular day. Some texts of the Septuagint (LXX), dated as early as the second century BCE, do have titles that identify other daily psalms with the exception of those for Tuesday and Thursday. Those that do bear titles in the LXX — for Sunday, Monday, Wednesday, Friday and the Sabbath — accord with the later rabbinic listing. This testifies that the tradition of reciting these particular psalms on set days must have been established at least as early as the period of the Second Temple. The psalms for Tuesday and Thursday are not identified in the LXX, possibly owing to differences in the date of the text consulted, or else the psalms may have been preserved for other ceremonial uses. 1. Why were these particular psalms chosen for the Temple liturgy? 2. Why were they transferred to the synagogue liturgy? According to Tamid 7:4, attributed to Rabbi Judah in the name of Rabbi Akiva in a baraita cited in TB Rosh HaShanah 31a, each psalm reflects a day in the week of Creation. Maybe Rabbi Akiva read a more sophisticated idea of Creation into the psalm text, providing a theological-homiletical basis for the transition to a new, less territorial/nationalistic-centered Judaism in which the loss of the Temple and its burnt offerings did not deprive the people of the daily psalms they knew and presumably loved. The late tractate Soferim (18:1) confirms that the psalms of the day were transferred to the post-Temple liturgy; reciting biblical texts at the appropriate time was “regarded (by God) as though one had built a new altar and offered a sacrifice upon it.” Thanks to this interpretation, elements of the Divine service, including the psalms, compensated for the lack of a Temple, although Judaism continued to hope for the restoration of the Sanctuary. The daily psalms, thanks to our baraita, could now be seen in a universalistic spiritual and ethical sense. This interpretation helped towards reconstructing Judaism and responding to the new events and challenges of the struggle against the Romans. Other Temple rituals were also transferred to the synagogue and sometimes reshaped, e.g., sounding the shofar on Rosh HaShanah (now no longer done on the Sabbath) and performing the Sukkot processions around the reading desk while carrying the Four Species. The idea of instituting practices to recall Temple times, zecher lamikdash, is well known. The domestic observance of Passover, no longer prioritising the paschal lamb, gave new status to matzah as the chief Passover food. Where the Bible accorded primacy to the paschal lamb and ordained that it be eaten with matzah and bitter herb (Ex. 12:8), Mishnah Pesachim (10:3, 5) equated the three foods (cf. Tosefta Pesachim 10:9-10). There is a relevant passage in TB Pesachim 54a with parallels elsewhere: “Seven things were created before the world: the Torah, repentance, the Garden of Eden, Gehenna, the Throne of Glory, the Temple, and the name of the Messiah.” All seven are then deduced and derived from appropriate biblical verses. They are all considered “indispensable prerequisites for the orderly progress of mankind upon earth.” These seven things also symbolise the central concerns of Judaism, among them the Sanctuary, the loss of which is seen as a temporary intermission in Jewish history. Rabbi Akiva, to whom the baraita in TB Rosh HaShanah is ascribed, was adamant that “the wicked kingdom” (Rome) would finally be defeated and the Temple would be rebuilt. In the meantime, Jewish worship could and must continue, and the daily psalms were reinterpreted for the changed situation. The following analysis will endeavor to elucidate the rabbis’ explanations, connecting each psalm to a different day of Creation. Sunday’s psalm: On Sunday, the choice — rather obviously because on that day the creation of the world began (Gen. I) — is Psalm 24, which asserts, “The earth is the Lord’s and all that is in it” (verse 1). According to the baraita, “on the first day He took possession (kanah, which also means “created”) and gave possession, and was ruler in His universe,” echoing Genesis 1:1-5. Rashi explains that although He gave possession of the physical world to humankind (Ps. 115:16) He remained the ultimate ruler, not sharing authority with any other power. A later age might have read into the allocation of this psalm to Sunday a protest against dualism and trinitarianism. The baraita hints at the movement towards and entry into the Temple of the King of Glory, when it says “He took possession… and was ruler” (verses 7-10): history began when the Divine realm was created and God asserted His rule – the triumph of monotheism. Monday’s psalm: The baraita says that Psalm 48 was selected for Monday because it says, “Great is the Lord and highly to be praised in the city of our God” (verse 2), indicating that “He divided His works and reigned over them like a king.” According to Rashi, the division refers to the distinction “between the upper and lower worlds,” cf. Genesis 1:6-8. The Zohar suggests an early sexual notion of “the waters above the firmament” (“the upper waters”) being male and those below the firmament (“the lower waters”) female. The upper waters – generally the rain – irrigated the earth and led lo fertile growth. When the baraita says, “He reigned over them like a king,” it might echo a notion that God exerted His power and forced the waters to obey His will. Tuesday’s psalm: The brief Psalm 82 is recited on Tuesday because it proclaims in its first verse: “God stands in the congregation of the mighty” (or: “the judges”). The baraita continues, “because (on the third day) He revealed the earth in His wisdom and established the world for His community.” This apparently relates to Genesis 1:9: “Let the waters under the heaven be gathered together in one place and let the dry land appear”, which indicates that when all is in its due place, the world will be firm. A true system of justice is a key element in keeping the universe stable. This is made clear when verse 5 of the psalm specifically declares that, if there are poor judges, “all the foundations of the earth are moved”. It should be pointed out that where verse 3 reads literally “judge the wretched and the orphan”, rabbinic thinking tends to interpret shiftu as “help” instead of “judge”. Ibn Ezra and other exegetes point out that since the disadvantaged are unable to plead their cause properly the judge helps to formulate it for them. In the Jewish concept of justice, earthly judges, like the heavenly Chief Justice, cannot allow the disadvantaged to suffer but must support their cause. Wednesday’s psalm: The argument for Psalm 94 cites verse 1, “O Lord God, to whom vengeance belongs”. This psalm may be seen as a continuation of the one for Tuesday, which presents God as the Champion of Justice. However, the baraita suggests that the reason for judicial corruption and inefficiency is not mere ethical deficiency but theological error: “He created the sun and the moon and will one day punish those who serve them.” Those who – flouting the stem warnings in Deuteronomy 17:3, etc. – worship idols, including the heavenly bodies that were created on the fourth day, will be severely punished. God, who made the heavenly bodies, remains their overlord. They are able to function only because of His will. However, the psalm text itself has no explicit reference to worshiping the sun, moon, or other heavenly bodies. To avoid ending the psalm on a negative note, some rites append the first verse (others, the first three verses) of Psalm 95. Thursday’s psalm: Because verse 2 of Psalm 81 reads, “Sing aloud to the God of our strength” (or: “our strong God”), the baraita states, “He created fish and birds on the fifth day to praise His name.” The whole of Creation declares His praise – the earth and the heavenly bodies (Ps. 19:2); the flora and fauna; the rivers, mountains, and seas; man himself; and even time. Such praise is not necessarily expressed through words, but sometimes through sounds and sometimes without them (“To You silence is praise” – Ps. 65:12). Although the LXX does not say that this is the psalm for Thursday, it calls it “a psalm… concerning the winepresses” because the Hebrew superscription al hagittit could be connected with gat, a winepress. It may have been composed for the festival of Sukkot, celebrating the vintage, although the first part of the poem seems to refer to the New Year. Gunkel and others think that gittit was a musical instrument used in Gath. Friday’s psalm: The choice of the short Psalm 93 for Friday is due to the first verse, “The Lord reigns, He is clothed in majesty,” “because He completed His work on the sixth day and reigned over His creatures.” The LXX calls this a psalm “for the day before the Sabbath, when the land was first inhabited.” The implication seems to be that until man’s creation on the sixth day. God had no subjects over whom to be King. “The world is established” (verse 1) echoes the refrain in the first chapter of Genesis that the Creator, after completing His work, surveyed what He had done “and He saw that it was good”. The psalm for the Sabbath is Psalm 92, “A psalm, a song for the Sabbath day”. Although its title indicates an intrinsic association with the seventh day, nothing is said about the Sabbath in the text. One might homiletically suggest that when the Creator completed His work and blessed it (Gen. 2:1-3), man, His creature, acclaimed Him and pondered how to handle the world that had been placed in his hands. The Sages explain the link with the Sabbath in a number of ways. Midrashic comments suggest that it was not necessarily God’s – or man’s – praise of the Sabbath, but rather a song by the Sabbath itself in praise of its Creator. The idea that days can and do praise God (though this is not the literal meaning of the verse) is found in Job 32:7: “Days should speak (yamim yedabberu), and the multitude or years teach wisdom”. The Targum on Psalm 92 calls it “a psalm and song which Adam uttered on the (first) Sabbath,” shifting the focus from the Sabbath to Adam (cf. Midrash to Ps. 92; Avot deRabbi Natan, ch.1). Our baraita introduces a new theological interpretation, “for the day [the world to come] which will be all Sabbath.” This echoes the growing interest in the afterlife in Maccabean times. Its notion of the world to come is of an unending Sabbath, when the universe will be at rest and evil will be overcome. Abraham Joshua Heschel points out: “That the Sabbath and eternity are one – or of the same essence — is an ancient idea,” although he does not define “ancient’ or “eternity”. There is no compulsory dogma of eternity, and speculation is not greatly encouraged (TB Chagigah 11b). Rabbinic expositions of the world to come tend to be midrashic or folkloristic. Shabbat as a foretaste of the world to come is found in TB Berachot 57b, which records a proverb that the Sabbath is a sixtieth part of the world to come. Sabbath bliss is a paradigm of eternal bliss. ln a fascinating piece of later homiletics, the Zohar moves the daily psalms onto a broad historical plane (though to our eyes it rather minimizes the last two millennia). It declares that the seven psalms represent seven 1000-year periods. The first period, called a day because Psalm 90:4 says “a thousand years in Your [God’s] sight are like yesterday”, is the first millennium up to the Flood, represented by Psalm 24; the second is the period in which Mount Moriah was chosen, symbolized by Psalm 48; the third is the one in which the Torah was given, suggested by Psalm 82; the fourth, represented by Psalm 94, is the era in which the Temple was destroyed; the fifth., indicated by Psalm 81, is the historic period when Judaism survived without a Temple; the sixth is the millennium in which God resumes His rule, symbolized by Psalm 93; the seventh is the messianic future, indicated by Psalm 92 (cf. TB Sanhedrin 97a, Avodah Zarah 9a). Drawing a list of stages in Jewish history from the verses of a liturgical poem is a relatively common device, Chad Gadya and Ma’oz Tzur being two examples. Another attempt to find logic in the choice of the psalms of the day appears in an article by Dr Rachel Reich in the Bar Ilan University Daf Shavu’i for Bechukkotai 5768. She offers a rather mechanical explanation which does not address the contents but the style of the seven psalms. She affirms that the psalm for the first day has God in the first word, the one for the second day has Him in the second word, and so on. This is ingenious, but Dr Reich herself admits that the theory is no watertight and, in any case, it is doubtful whether the priests and poets of the First and Second Temples favored such artificial devices. There is no clear reason why particular psalms were designated to be recited on different days of the week. 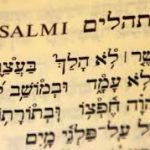 The rabbinic view, found in the Talmud, connects each psalm to a different day on the basis of hints to each day of Creation found in the psalms, but often these connections are not clearly indicated in the psalm’s actual text. The Zohar connects each psalm to a different millennium, but again the connections are not always apparent in the psalm itself. A modern approach suggests a technical reason for each psalm’s choice, having nothing to do with its content. These interpretations all seem forced and largely unconvincing, because almost any psalm could be made to fit a particular day of the week. While these psalms are recited today as a remembrance of the Temple service, the reason why they were originally chosen remains a mystery and could have been lost soon after the Temple was destroyed. 1. Evidence from the period of the Second Temple is preserved by the second-century BCE author Ben Sira (Ecclus. 50:15-19). 2. New English Bible translation (1970). 3. Margaret Barker, Temple Themes in Christian Worship (London: T. & T. Clark, 2008) p. 137. 4. Translation of the Greek Septuagint Bible, ed. Lancelot CL Brenton, 1851; according to the New English Translation by Albert Pietersma (London: Oxford University Press, 2009), the days of the week are not stated in all texts. 5. Soncino Talmud, Pesachim (London: Soncino Press, 1938) p. 265. 7. Hermann J Gunkel, Introduction to the Psalms: The Genres of the Religious Lyric of Israel, ed. JD Nogalski (Macon: Mercer University Press, 1978). 8. Abraham Joshua Heschel, The Sabbath: Its Meaning for Modern Man (New York: Farrar, Straus & Young, 1951) p. 73. 9. Arthur Marmorstein, Studies in Jewish Theology (London: Oxford University Press, 1950), chapters 5, 6. 10. See Bi’urei haGra on Tamid 7:4, also Pinchas Kehati on the same mishnah. 11. Ephraim E Urbach, The Sages: Their Concepts and Beliefs (Jerusalem: Magnes Press, 1987) pp. 677-8. This entry is filed under Articles, Bible/Tanach, Prayer.